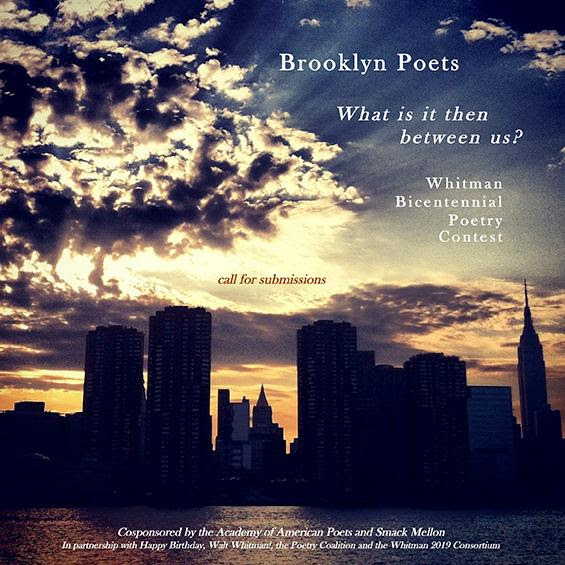 Whitman answers with supreme confidence that whatever is between us “avails not,” that neither time nor distance separates him from us or anyone else. But how do you hear that question? How has it taken on new resonance today? Brooklyn Poet Laureate Tina Chang, Mark Doty and Rowan Ricardo Phillips will judge the contest, selecting three winners from three different age brackets: 13-17, 18-22, and 23+. First prize in each bracket will win $250; second prize $100; third prize $50. Entering the contest is free. Please submit one previously unpublished poem only. The winners and judges will read at the bicentennial celebration on Friday, May 31 at Smack Mellon in DUMBO and have their poems published in a commemorative pamphlet. Submissions are due by Sunday, March 3 (11:59 PM). Winners will be announaced at the end of April. We strongly encourage women, writers of color, LGBTQ+ writers, indigenous writers, writers with disabilities and writers from other underserved communities to apply. Stay up-to-date with art events, openings, and exhibitions by signing up for our mailing list.